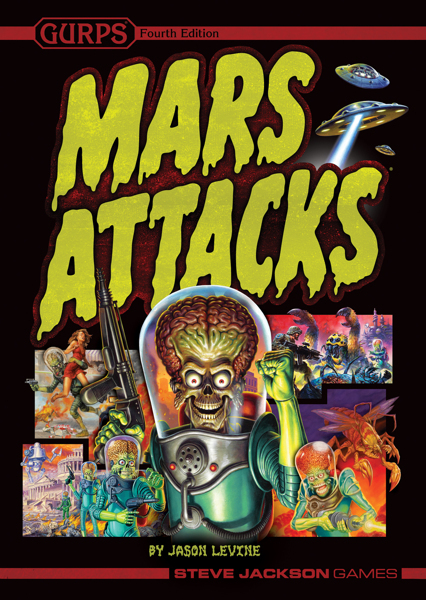 If you've played Mars Attacks: The Dice Game, or are a fan of Topps' trading cards (they're doing a Kickstarter for a new run of Mars Attacks cards), and want some Mars Attacks in your GURPS, boy have we got you covered! 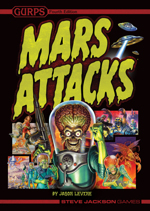 The Martians descended upon Earth without warning. Saucers filled the skies. Blaster-wielding soldiers, giant insects, and unstoppable robots slaughtered the human defenders on the ground. It could have been the end of humanity -- if not for the brave scientists of the Novas Vira, the only ones who saw the invasion coming! Now the fate of Earth hangs in the balance as both sides turn to science, desperately inventing new weapons and defenses in the hope of finding the one that wins the war. Choose your side. Are you among the conquerors here to grant Earth the honor of being added to the Martian Empire? Or are you fighting to save your planet -- either on your own or as part of the Novas Vira, Tiger Corps, or United Earth Alliance? Lock and load. It'll take spirit to win this war, sure, but also technology. Learn about the weapons, defenses, vehicles, and strange inventions of both sides -- and take advantage of streamlined rules to make new ones.